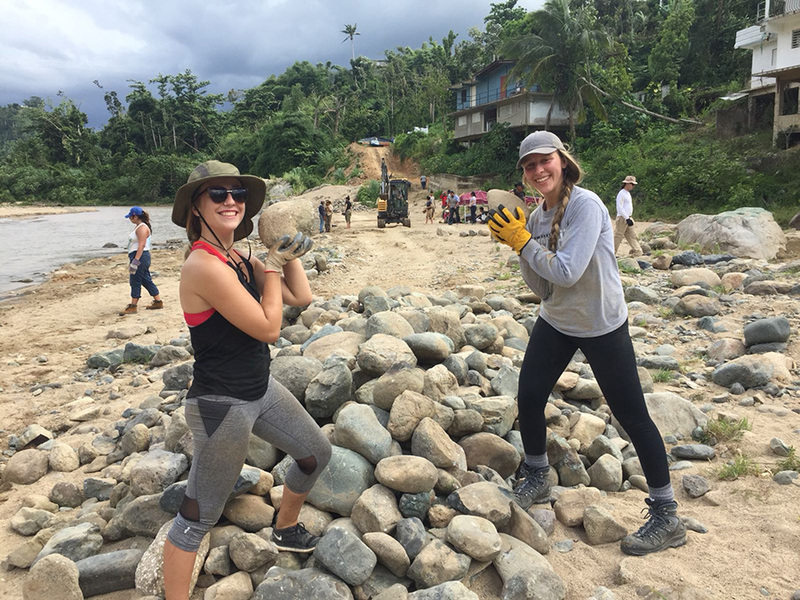 ESF students work on beach cleanup in Puerto Rico. Students from ESF have spent most of this week helping rebuild Puerto Rico following last year's devastating hurricanes. The ESF contingent joined students from SUNY Albany and SUNY Maritime College as part of The NY Stands with Puerto Rico Recovery and Rebuilding Initiative inspired by New York Governor Andrew Cuomo. The group traveled to Puerto Rico aboard SUNY Maritime's Training Ship Empire State VI and were housed aboard the ship during the four-day stay in Puerto Rico. The students worked on projects focused on agriculture, tourism and construction. Other groups of SUNY students will travel to Puerto Rico throughout the summer to continue the recovery and rebuilding efforts. The students worked with two local non-profit organizations: Relief 4PR and Fundación Buena Vibra. They helped clear brush and debris at the Parque Forestal Bayamón, cleared drainage culverts to mitigate flooding from future hurricanes and helped maintain and preserve crops on a farm in Santa Isabel. The crops are intended to be exported to New York state at a later date. The SUNY students also helped reconstruct homes and restore neighborhoods by painting, landscaping and power washing damaged community centers. Their efforts were concentrated in Toa Baja, Morovis, Bayamón, Humacao and Santa Isabel. "We are pleased to support Governor Cuomo's NY Stands with Puerto Rico Recovery and Rebuilding Initiative," said SUNY Chancellor Kristina M. Johnson. "SUNY is proud for their release efforts and hundreds of students who will be in Puerto Rico helping support this cause."